Yesterday, my wife and I went to Mos burger which has just opened in Tenmonkan. 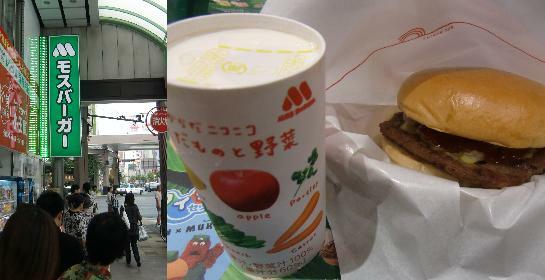 because the hamburger shop offered a drink ticket worth 1000 yen to the first 2000 people. It took us about twenty minutes to get in the shop. We ordered a hamburger and a pack of vegetable juice each other and paid money separately. And then, we got drink tickets worth 2000 yen in total. I think that we have no shortage of drinks this summer.